How It's Made - Henry Molded Products Inc.
Henry Molded Products packaging and containers are manufactured using 100% pre- and post-consumer newsprint, Kraft paper, and other selected waste papers. 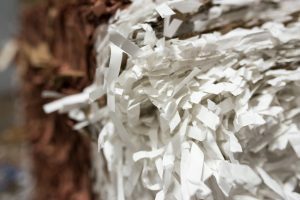 The paper is fed into a pulping machine and is reduced to small pieces . At this stage, the pulp is a thick gray porridge. Next, natural waxes and binders are added for stability of finished products. For some of Henry Molded Products this means being able to withstand fluid leakage for weeks. 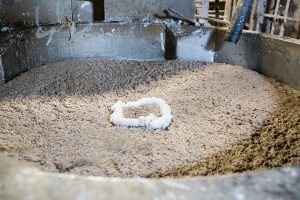 The mixture undergoes a final screening and additional mixture of water to bring it to the correct consistency for the molding process. Henry Molded Products utilizes custom molds that enable water to be removed as the part is being formed. A fine screen gives each molded part a semi-smooth finish. 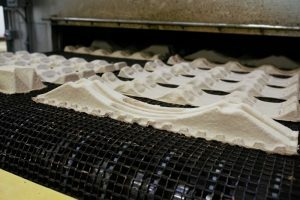 The molding machine draws the pulp into the mold creating the desired thickness and strength as the water is removed. Then, when the molded “felt” is dry enough to support its own weight, it moves down the belt into the oven. Here, the drying process substantially reduces the weight. Finally, the finished moldings undergo a final inspection, are packed, and prepared for delivery to the customer.